The end of the school year can create a lot of difficult feelings for children who are just completing their first or second school year. As adults, it’s easy for us to assume that everyone understands and embraces the excitement of the annual academic cycle. But little “graduates” have never gone through the yearly wind-down at school, or the last time they did feels very remote in time. It was, after all, a quarter of a lifetime ago for them. So invoking last year’s rituals might not help. When the rituals fail to comfort the sadness, some grownups swoop in with distraction by building excitement about what comes next – talking about the newer, bigger classroom they’ll have next year, or even the new school. This method generally backfires; children become anxious about the unknowns – especially for something that is months and months away … which, honestly, September is. Talking about kindergarten in May is natural for parents and teachers; it’s part of our preparation process. 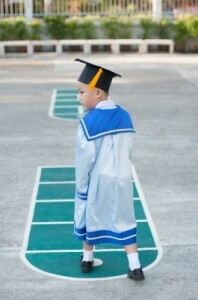 But it is confusing to the preschooler who took months to settle in to this year’s teacher, classmates and routines. The idea of a school year literally “ending” can be disconcerting to the young child who thought that the year would go on forever – that “she would be my teacher forever.” Saying goodbye can be scary, sad and maddening. Your child may need assurances about how to stay in touch with a teacher or special classmate, and how to keep school in mind. Reassure and put feelings into words. Respect your child’s conflicting feelings and teach him or her how to say it in a sentence. (“I am ready for new things, and I want everything to stay the same even though it can’t.”) Let your child know that you have mixed feelings, too. Foster a comforting transition. Make some simple plans that give your child something to look forward to, especially the first week of summer. Let your child have some control over the choices (which day to stay home and bake; which day to work in the garden). Many families like to set summer play dates with classmates; choose 3 to 4 dates in advance and give each child a printout of the plan. This gives them a concrete reminder that they will see school friends in a few weeks. One way to make these plans easy on everyone is to meet at a community playground, so no child is host and no child is guest. Opt in and out. Don’t be shy about skipping a few rituals. Our society tends to build in a lot of end-of-the-year hoopla; it may be too much for your child. Only you can judge the right amount of revelry or when it’s better to stick close to home. Be mindful that you will likely be invited to more events than your child can reasonably handle. The overall objective at this time of year is to help your child stay in the moment and to notice the array of emotions that come with change. That is the best graduation gift you can give. During these moments, you are building your child’s lifelong resiliency. It’s the icing on the graduation cake, so to speak. This is a such a nice reminder for staying in the moment and recognizing the challenges of transition. Mia and Ted react to the changes in school year routine, even as a teen and tweenie! Thanks for the thoughtful ways to frame why and how our family is building our summer differently than others might!